Team collaboration doesn’t need to be chaotic and stressful. Twist – from developers of the top-ranked productivity app, Todoist – coordinates all your team’s discussions so that they are always organized, on topic, and in one place. Twist helps make team communication better, more structured, and more productive so your teammates can focus their attention on the work that really matters. 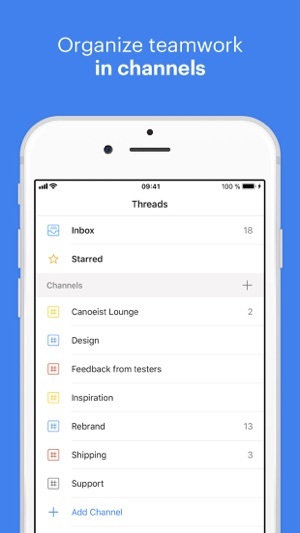 Keep all your conversations and team chats organized by projects in asynchronous threads - so your team can choose when exactly to connect to discuss things and when to disconnect from Twist to get work done. Plus, unlike email, everything stays accessible and searchable for everyone, forever, so no team work is ever lost or buried, even if someone leaves your team. 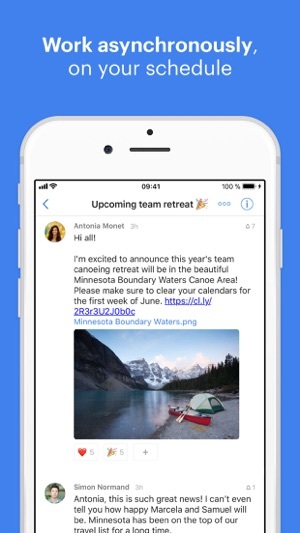 Receive important updates on post announcements, discuss ideas, coordinate project updates, and gather feedback right on your iOS device. 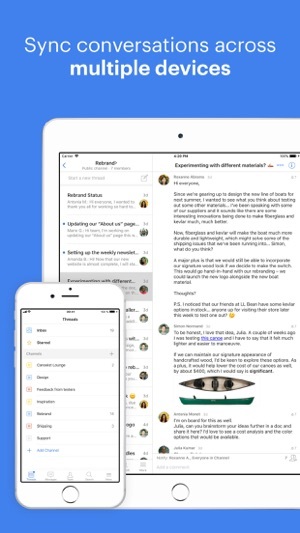 •	Keep all your organization’s different types of team communication and team messaging in one single place. •	Organize your team discussions into specific channels so everyone is fully coordinated and on the same page. •	Use asynchronous threads to organize specific discussions within a project. 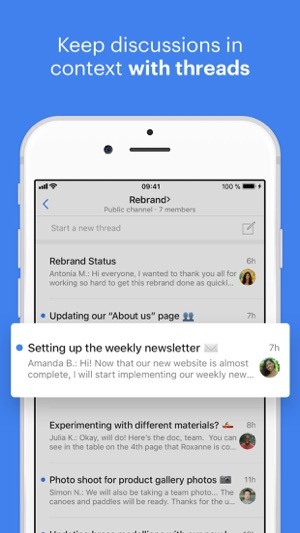 •	Easily choose which specific team members to notify in each specific thread. •	Send direct messages to one or a few people for quick questions or just to socialize in real-time. •	Loop in guests, clients or contractors so your communication stays centralized and accessible. •	Attach files and easily find them in past discussions. •	Integrations with Github, Todoist, Zapier and more. We’d love to get your feedback and suggestions on how we can make Twist even better. Reach us at @twistappteam on Twitter or feedback@twist.com. 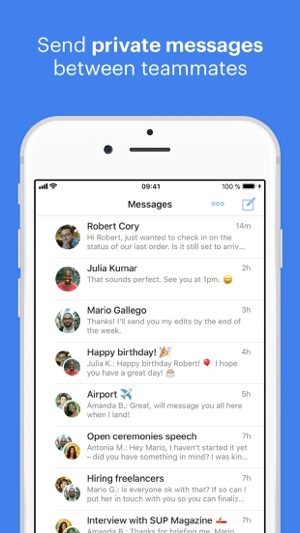 - Adds support for message actions. - Handle cmd+return on sending/editing messages, comments. - Underlying changes on Channels View. - Fixes on dynamic row height calculation. - Fixed alignment on attachment on self message cell. - Fixes upload cell heights. I’ve used slack for several years, and been bothered by all the notifications and lack of focus on threaded (on topic) communication. I absolutely love the concept and implementation of this app! It is my go-to for teams now, and completely replaces the need for email in my book. It feels in some ways like it is still in its infancy in supporting some features. Here’s an example: I love how I can share links to specific threads, but I don’t like how it takes users out of the app to the browser, rather than just redirecting them into that specific thread within the app. That said, I will push teams that I’m involved in to move to this app, and any new teams I am involved in will use this if I can help it. I’m a student and growing app developer myself, and see a lot of value in organized, asynchronous communication. Thanks for taking the time to really think through fundamentals of communication and productive work before developing just another communication tool. This is not just another one, this is the only one I want to use. For the first time since launch, there’s a share extension! Thanks so much for figuring out how to implement it. My only gripe is that it kind of goes against how Twist should work, since it creates new threads for each shared thing instead of allowing you to share with more granularity, by posting into specific threads. For example, I share about 30 links or so every day and organize them by topic. Have an infinitely long amount of threads would not be ideal as a result. Having tried Asana and Slack, I find that Twist is far better for my needs in communicating with my team. Developers are quick to address issues (THANK YOU!!!) and seem intent on improving it.